Footage showing smoke and fire originating from the roof of a structure known as the Marwani Prayer Room, or Solomon's Stables, could be seen on social media. The Palestine News Agency, the official outlet of the Palestinian National Authority, cited a guard as saying Monday that "the fire broke out in the guard's room outside the roof of the Marwani Prayer Room, and the fire brigade of the Islamic Waqf handled the matter successfully." Trump : Water bombing from above, Just do it.!..? The walls and towers have held, hopefully the crown of thorns is safe in the sacristry. The Louis's gave away all the thorns to other kings, but it is an impressive relic. Trump: It's fake news that water bombing would lead to collapse. I constantly filled balloons with water and water bombed people from the third floor of my dorm in college and no one ever collapsed. And if they were smoking it always put out the fire. Everybody knows Trump is an expert on firefighting AND 13th century Gothic architecture. He did win the election....proves it. Hah. Only one hah because he prolly did it in military school. NBC is reporting the organ at Notre Dame Cathedral (the largest organ in France) was not damaged. Also interesting on CNN, one of them mentioned that the Paris fightfighter job is a military service job, so they have all these gung ho young guys on it that are the best of the best, but then they have a real tough captain, marine-sergeant style, to keep them from going wild. That they are renowned among firefighters for this reason. And after they finish Paris duty, they usually go to head fire departments in other areas. Cavaet: nobody is saying anything so far about The Major Major Windows. 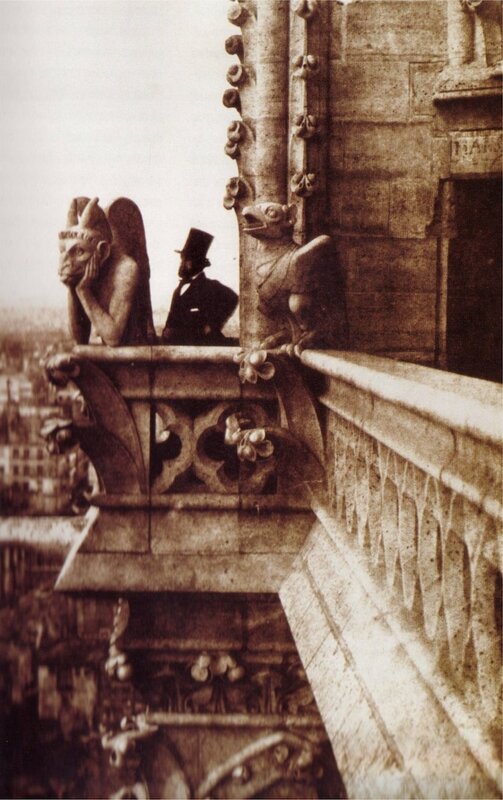 [....] In the 1800s, Notre-Dame was in crisis. Bored of the Gothic style and embracing Baroque architecture, Parisians all but petitioned for the crumbling cathedral’s demolition. Fortunately, French writer, playwright, and preservationist Victor Hugo sought to save it. In order to remind the public of its historic importance, he penned The Hunchback of Notre-Dame, a novel that celebrates the mystery and magnificence of the Medieval cathedral. As a result of the book’s success, there was a renewed interest in the church, leading the king to call for its refurbishment. In 1844, architects Jean-Baptiste-Antoine Lassus and Eugène Viollet-le-Duc were commissioned to restore the aging cathedral. The duo employed a team of craftspeople who repaired existing features and added new elements, including a 750-ton spire, copper statues, and the now-famous 56 chimera. By Wednesday, some 850 million euros — more than $960 million — had been offered by wealthy French families and businesses to repair the cathedral. The spectacle of billionaires trying to one-up each other quickly intensified resentments over inequality that have animated the Yellow Vest movement.